Get Elderly Home Care as well as Elderly Health Care here. VitaMistVitaMist is your first choice for quality discount vitamins, minerals, herbal products, and nutritional supplements online. Discount Vitamins and Nutritional Supplements. Vitamins for all needs. No pills, just spray into mouth. Discover the Secrets of Elderly Home Care and Elderly Health Care from a family who has taken care of their elders. Has your elder gotten to the point where they cannot take care of themselves and you're worried that their physical or mental abilities cannot allow them to live alone? Do your elders take their medications? Do they take too many medications at once? Your worst nightmare can be putting them in a nursing home where they will be neglected or abused. You want to do what the best for them and you're not sure how to do that. My how-to E-books will guide you through elder care while keeping their dignity and hopefully your sanity. I can help you with elder care issues!! Ask yourself, how can she help me with my elder care? I can because I have taken care of my elders for the past 4 years and kept them out of a nursing home and brought my Dad's sister, Jay, to live with them from a nursing home in Florida. My Mom became the primary care giver for my Dad who had a stroke in 1990 at age 70. In 2003, Mom had extremely high blood pressure and her medications weren't controlling her problem. The Cardiologist preformed a cardiac cauterization on her and found that 3 of her major arteries were just about totally blocked. The doctor preformed triple by-pass and four days later, she had a huge stroke. The right side of her body became paralyzed, her ability to speak didn't exist, her eyesight had diminished so that she became blind in the right half of both of her eyes, and she could not walk or stand. My parents lived an 8 hour drive to their closest child. 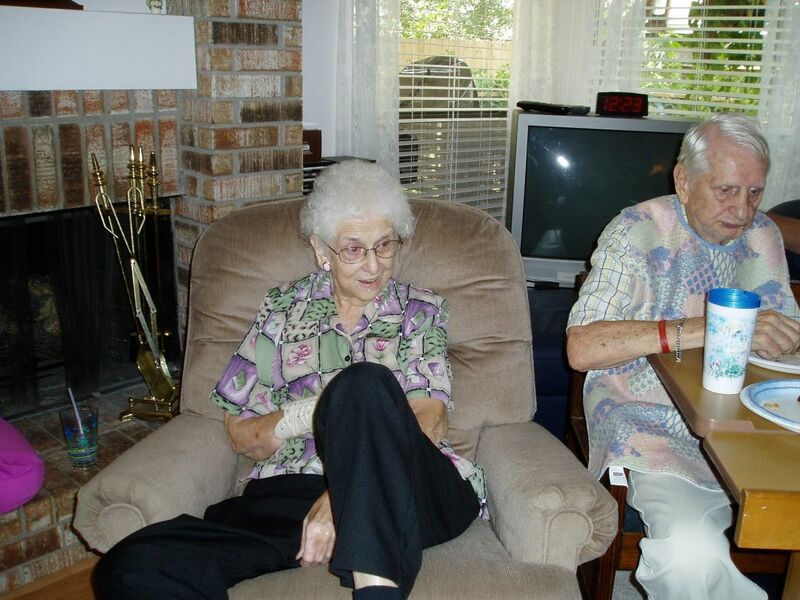 My two sisters, my brother and I had to figure out how to care for our elderly parents for the rest of their lives. I want to pass on the information that our family has learned about elder care from trial and error to save YOU time and effort. When our family embarked on this journey of elder care, information on elder care did not exist. I want to change that. I will say that I don’t know all there is to know about elder care, but I know what has worked for our family. We have made mistakes and have learned by them. • Get real life elder care suggestions and hints that really do work! • You will have peace of mind because you will know that a resource exists for you. Also, I have a forum where you can make topic suggestions for me to write an e-book to help you and others!! I am so sure you will learn helpful information from my E-books that if for any reason you do not find my information helpful, I will gladly refund your money within 90 days of purchase. Send me your order info and I will refund your money, no questions asked! Well, I may ask you what I could do to make it better, but I will never ask why you want a refund. Come on in and discover the Secrets of Senior Health Care and Senior Citizens Health in general, get a FREE E-book and buy a book or two.